At Craighross Castle you can let your imagination soar as you rule over a mystical kingdom in one of the world’s most beautiful and unspoiled beach locations. The historic, privately owned Noetzie Castles are world famous. Located just 20 minutes from Knysna, their stunning oceanfront location and extraordinary design have made them a favorite retreat for the rich and famous – including Nelson Mandela and his family. The stunning sandy beach, rocky outcrops harbouring wild oysters, the meandering Noetzie River and the backdrop of fynbos-covered cliffs are part of a prime nature conservation area. Dolphins, sharks and whales (in season) are regular visitors, as are several species of sea birds and raptors. By night, the minimal light pollution makes stargazing an unforgettable experience. Being right on the beach, you’ll wake up to nothing but the roar of the Indian Ocean and the call of the oyster catchers. Here you can forget the stresses of everyday life in an environment of peace and seclusion. The extensive and spacious accommodation offered at Craighross Castle is enhanced by modern facilities. Sleeping up to 13 people, plus a separate room with its own entrance (for the live-in maid), it’s perfect for large families or groups of friends. It features an impressive master bedroom on the top floor with a lounge area, coal-effect gas fire, well-appointed en-suite bathroom with separate shower, dressing room and patio with glorious sea views. On the ground floor there are two en-suite bedrooms with king-size beds and superb ocean views, three further twin/king rooms (both with en-suite facilities) and a large children’s bedroom – playroom with 2 single beds. At the heart of the castle is a light and airy lounge/dining room with fireplace, opening out to a unique walled patio. Overlooking the beach, it’s a romantic setting for all fresco meals and sun downers. Off the lounge, there’s a separate family room with Satellite TV, DVD player & iPod docking station. The spacious, well equipped kitchen and adjoining utility room features a hob & oven, microwave, fridge/freezer, toaster, kettle and ample crockery, cutlery, cooking pots and utensils. A breakfast bar and wide serving hatch (with doors) link the kitchen to the dining room. NOTE: As the castle can only be accessed via the public steps and beach, guests should use the public car parking [at the top] and the allotted parking space at the entrance to the beach (around 100m from the castle). A free porterage service to convey luggage is provided at the beginning and end of your stay. This service can also be requested at other times for an additional charge. Craighross Castle is available for short-term rentals. Please follow the link above to see the full information of the property, gallery of images, 360º virtual tour and booking details. 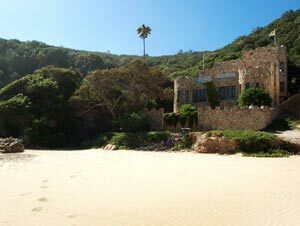 The area between Knysna & Plettenberg Bay is nature’s playground. In addition to scenic drives, boat trips on the Knysna lagoon & beautiful forest and coastal walks, there are several superb wildlife reserves and sanctuaries – perfect for children & adults alike. These include: Knysna Elephant Park, Monkeyland, Birds of Eden, Buffalo Hills & Plettenberg Game Reserves, Tenikwa Wild Cat Park, Noah’s Park Wolf Sanctuary, Eagle Encounters & Lawnwood Snake Sanctuary. A day trip to the ostrich farms in Oudtshoorn, the magnificent Cango Caves or the Tsitsikamma National Park will prove unforgettable. Safe paddling, swimming & kayaking in the pristine Noetzie River. Surfing and fishing on Noetzie Beach. Hiking, cycling, quad biking, scuba diving, horse riding & dolphin/whale watching are close by, as are extreme sports such as paragliding, bungy-jumping and treetop zip-line forest canopy tours. The superb golf courses at Plettenberg Bay, Goose Valley, Pezula, Simola & Knysna are all within easy reach. There are excellent supermarkets, boutiques and craft markets, plus superb choice of cafés, pubs and gourmet restaurants, in Knysna and Plettenberg Bay. Noetzie is a pristine, secluded beach which lies in a hidden bay bordered by the lush forest of the Sinclair Nature Reserve on one side and the fynbos landscapes of Pezula Resort Estate on the other. It owes its seclusion to the fact that it is accessed along a gravel road from Knysna’s N2 and a steep climb from the parking area down a narrow path and a flight of stairs hewn into the cliff.